The roots of the 315th Bomb Wing Lab, like all the elements of the 20th Air Force, lie deep in the training bases of the Second Air Force in the central part of the United States. 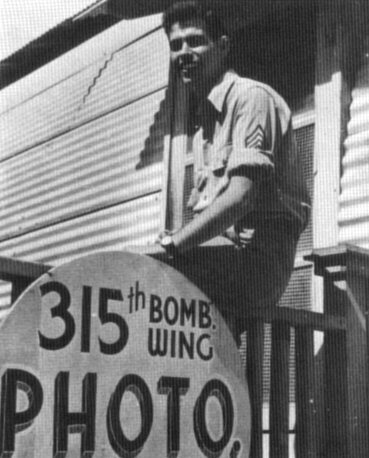 It was in the late summer of 1944 that the personnel of the Laboratory were slowly recruited into the Photo Sections of the Bomb and Service Groups of the 315th Wing. From such scattered spots as Dyersburg, Tennessee; Tucson,Arizona; Dalhart, Texas; from Saline, Walker and Pratt, Kansas; from Lincoln, Fairmont and Grand Island, Nebraska, the men were assembled and trained as units. The 23rd Photo Lab under Lt. Fred Graham trained at Fairmont, Nebraska, while the 28th Lab, under Lt. W. J. Porter smoothed out its organizational and operational problems at Harvard in the same part of the state. Lt. A. B. Normann got the 29th Photo Lab in shape at Grand Island, Nebraska, and the 30th Lab was assembled by Lt. A.L. Hinkle at McCook. The four Service Groups were trained in Kansas; the 73rd at Pratt, the 24th at Salina, the 76th at Great Bend, and the 75th at Walker, respectively. All phases of training were completed by February, and the Groups started overseas. The 23rd and 28th Photo Labs, and the photo personnel of the 73rd and 76th Air Service Groups, embarked early in March and arrived on Guam about April 12, 1945, and as such, pioneered in the construction and development of the entire Wing area, as well as the Photo Laboratory itself. Early in April, the 28th and 30th Labs, together with the 24th and 75th Service Groups, left the states, and on the 12th of May arrived on Guam to join the other units in the actual construction of the Laboratory. From that time on, life was on the grueling side. The Lab Technicians, who had been sheltered in Base Laboratories of the 2nd Air Force for the past two or three years, learned the mysteries of the pickax, the hand saw, and the aching back. The episode most vividly burnt into the minds and palms of these agonized laborers was the gouging of the drainage pit, a Herculean task involving 24-hour shifts with pick, shovel and jack-hammer to burrow a hole 20 feet by 20 feet by 15 feet in solid coral behind the lab. Needless to say, the job was done and the lab completed and ready for operation with the start of regular Empire Missions. Once the aircraft of the 315th Wing started operational missions over the Japanese Empire, training and construction days were over, and our real mission in the theatre started. Since, except for the first few training missions over Rota and Truk, our aircraft were equipped with the 0-5 Radar Camera, the great majority of our work was with 35mm film. This involved a complete change of perspective, as the photo labs of Very Heavy Bomb Wings were originally set up to handle large quantities of 10X10K-22 film, with no emphasis at all upon 35mm. Since, however, the 315th Wing was a special, pioneer radar outfit requiring large amounts of photography of the radar screen during the bomb run, the Consolidated Lab quickly converted its facilities to handle this type of film. Throughout the latter part of June, July, August and until surrender day, the lab worked at peak effort and efficiency, with superlative work being performed immediately after the return of an Empire Mission. On those mornings the entire shift would buckle down to develop, dry, view, and letter as many as 100 to 130 rolls of 35mm film. Production for the month of July reached a total of 1,400,000 negatives and 55,000 prints. Only through operating the lab on a 24-hour basis with the 23rd and 28th combining to handle one 12-hour shift, and the 29th and 30th the other, was this volume of work achieved. With the Japanese capitulation in the middle of August, the major mission of the Laboratory was completed, and all the gang, from the lab technicians, developing and processing in the lab, to the camera technicians, whose labors installing and repairing the camera had kept them on the line at all hours, were able to relax in the knowledge of a job well done. Looking back, we see that the Consolidated Photo Lab together with the entire 315th Bomb Wing was faced with a new and tough job in being selected to perform the revolutionary work in radar bombing which is carried through to such a successful conclusion. Many unusual problems were met and overcome, and every man can share in the knowledge that the contribution of this laboratory and Wing to the successful termination of the war was a significant one.